Syntec Optics has deep expertise in anti-reflective coatings. Anti-reflection coatings are used to reduce reflection, increase transmission and enhance contrast of your optical systems supressing residual reflection or eliminating ghost images. Whenever a ray of light moves from one medium to another (such as when light enters a sheet of glass after travelling through air), some portion of the light is reflected from the surface between the two media. Anti reflective coating works on the priinciple of destructive interference, where out of phase beams cancel each other resulting in reduced reflection. Index of refraction of coating, wavelength of light used, index of refraction of substrate, angle of incident light and coating thickness influence the transmission properties of anti reflective coating. Single layer dielectric coatings can be used to create a simple anti-reflection coating at a single wavelength, however to create an anti-reflection coating over a broader range of wavelengths is typically achieved utilizing several alternating high and low index dielectric materials. By using two or more layers, broadband antireflection coatings which cover the visible range (400-700 nm) with maximum reflectivities of less than 0.5% are commonly achievable. Anti reflection coating applications include optical systems containing many transmitting elements, low-light systems, applications demanding supressed residual reflection and reduced optical losses, etc. 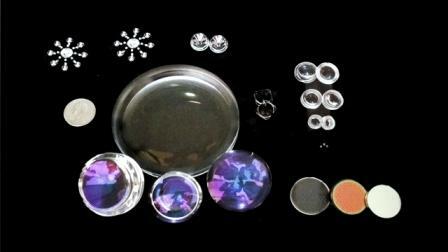 SyntecOptics.com is your one stop shop for all your anti reflective coating needs. We design durable anti-reflection coatings for your specific applications and wavelengths to optimize the performance of your optical systems.